Cotton cushion cover with village embroidery motifs, made by Penduka women in the countryside of Namibia. Machine washable, size 40cm x 40cm. 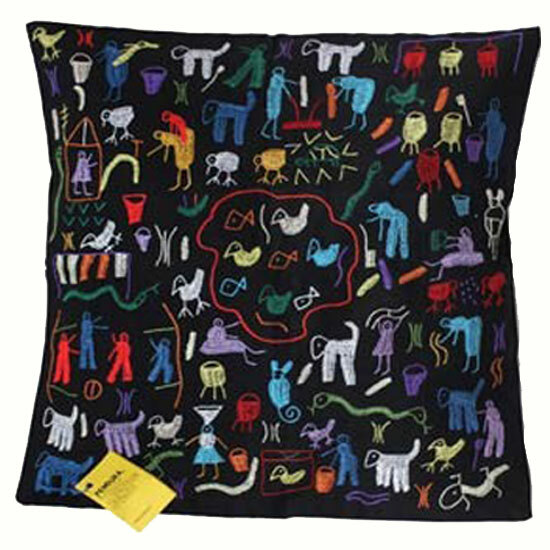 Cotton cushion cover with village embroidery motifs, made by Penduka women in the countryside of Namibia. Through embroidery they tell their story and process their experiences and problems. Once a week, the women come together to evaluate each others products, to hand it in and to fetch new fabric and thread. Embroidery can be done everywhere; while you wait at the well, while talking with your neighbour or even in the waiting room at the hospital. It is harder when the sun sets, therefore many women now have a small solar chargeable light. This way they can now work in the evening without being afraid that fire or sparks will destroy their work. Village embroidery motifs vary depending on what story the individual Penduka embroiderer has to tell (village scenes, fetching water, Katutura street scenes....). Available in natural beige with central white embroidery, black with central vibrant colours embroidery and black with all-over vibrant colours embroidery. Machine washable, size 40cm x 40cm. For other specific colour/ size variants or personalised motifs please contact us.